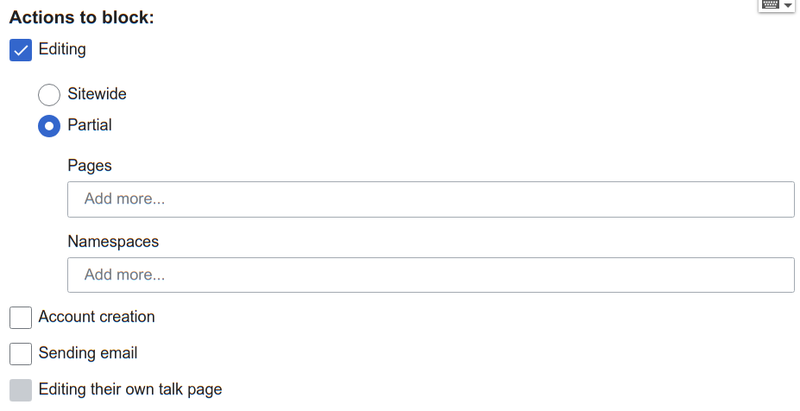 Fields that are not editable shouldn't be visible, unless if you select the option. Admins are potentially curious people and will certainly click on the buttons to see everything that can be done. The latest version of the Wikimedia style guide (or equivalent for interactions) dictates that UI elements should be enabled/disabled, not hide/show. These interaction patterns can change based on our users' needs but this is a question for @Prtksxna and the design team. I agree that these new elements take a significant percentage of space, but before we make any changes I want to see if the new changes will be palatable over time. I'm going to leave this open in the Backlog to address later, hopefully with some feedback from other admins. dbarratt added a project: MediaWiki-Interface. This comment is partially CYA, but lets not forget about T194301: Introduce temporary element on Special:Block UI to invite users to participate in the Partial Block consultation which ran from July 19-23 in multiple languages.